The Mosque of Cordoba is next to the Alhambra of Granada the most famous legacy of Moorish architecture, an Arab-Andalusian art treasure which at it´s peak of glory became the third largest mosque in the world.Currently, it is declared a World Heritage Site and is one of the most visited tourist sites. During the long centuries of Muslim occupation of the Iberian Peninsula, the Mosque of Cordoba was the symbol of the Caliphate of Cordoba, known in the East and West. The word mosque in Arabic refers to the name of masjid, a place where one prostrates before God. In the early eighth century Cordoba became the capital of Al-Andalus and from 785 began the construction of a place of prayer, the mosque, on a former Visigothic church. In total there are four phases of construction and expansion and the mosque was completed, with its present size of 23,400 square meters, 200 years later.During this time Córdoba experienced its Golden Age, reaching its peak in population, trade and culture.So while the rest of Europe fully lived the Middle Ages, in Al-Andalus are studied poets, philosophers, doctors and Greek mathematicians, and develop science and literature, poetry and mathematics, medicine and astrology. The fine, delicate and geometric Moorish architecture speaks for itself about the cultural progress of this civilization in these moments of history. After the Christian reconquest of Cordoba in 1226, the mosque was used by Christians to celebrate their faith, but after the final expulsion of Islam from the Iberian peninsula in the sixteenth century, the mosque suffered its biggest change with the construction of a Renaissance cathedral inside. The works in their beginning had been supported by Charles V, who repented after seeing that they had destroyed "something unique" in the world. However, the fate of the Mosque of Cordoba has been relatively favorable, as it has not shared the fate of the other mosques in Al-Andalus to be completely demolished to give way for the construction of churches and cathedrals. 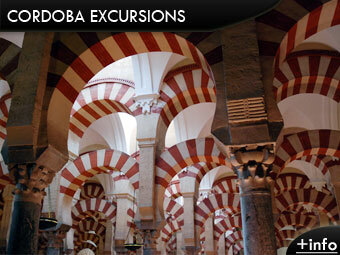 The Mosque of Cordoba maybe was saved because of its stunning grandeur and beauty. Today, the Mosque-Cathedral of Cordoba unites in one single enclosure Andalusian, Gothic, Renaissance and Baroque styles. The Mosque-Cathedral basically consists of three parts: The Patio de los Naranjos, the Mosque and the Cathedral. The whole complex is walled and about a quarter of that is occupied by the Patio de los Naranjos, an open space with plenty of orange and lemon trees and fountains. In this site is also located the Tower, the old Arab minaret. Inside the mosque we can appreciate the splendor of the art of the caliphs at its peak, with a forest of eight hundred fifty columns of marble, jasper and granite on which rest three hundred sixty-five bicolor horseshoe arches. The Tickets to the mosque can be purchased at the box office the day of the visit to the monument. Its price is 8 € for adults, 4 € for children 10 to 14 years and children under 10 enter for free.There are also private visits and educational tours, night tours and guided tours. The monument's opening hours are from November to February Monday to Saturday from 10 am to 6 pm and Sundays and religious holidays from 8.30 to10.15 am and 2 to 6 pm. The months of March-October opening hours are Monday to Saturday from 10 am to 7 pm and Sundays and religious holidays from 8.30 to 10.15 am and 2 to 7 pm. Because in the mosque currently take place religious cults, these times should be respected and visitors can only enter being properly dressed. The night tour takes place with varying dates and times throughout the seasons, so you should inform about before. The price of this tour is 18 € and is available with an audio guide in 8 languages. The guided tour to Cordoba includes the Alcázar de los Reyes Cristianos, the Mosque-Cathedral, the Jewish Quarter and the Synagogue of Cordoba.This tour lasts approximately 3 hours and the price is € 36.50 per person, with free admission for children under 8 years.The guided tour takes place in English and Spanish. Cordoba can easily be reached by high speed train AVE from Malaga, Seville and Madrid, by bus and car.